Kevan Jon Bonnie Wiggle knee dress. This fabulous dress features fully ruched sides for an amazing fit and flattering shape giving you the confidence to “wiggle” those hips. No zips or fastening its fully ruched style means its easy to pull on and wear. 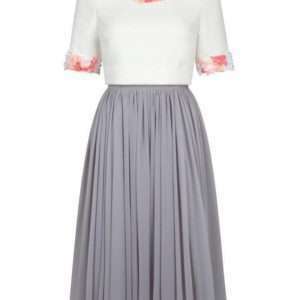 The fold over top half is very glamorous worn as a bardot off the shoulder style but this dress can be worn with one arm out for a different look. Team it with this solid metal belt for a party look. Wherever you take this dress its easy to wear, easy to pack and easy on the eye!